Make a set of cards for the game of memory. 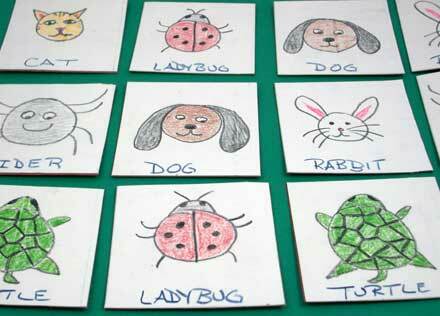 This is a fun and very easy project that young kids really love doing! It is great for families or groups, and with a little preparation by the adult or teen leaders, this project is fast and fun. 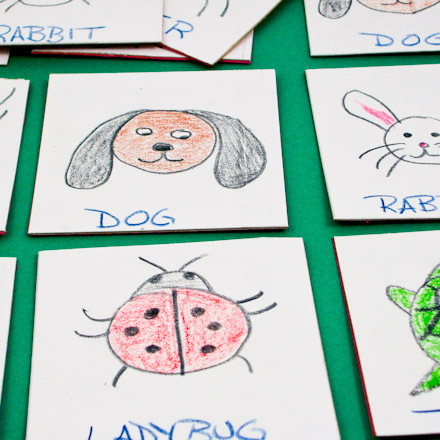 Related craft: The Match Cards and Game craft project includes printable patterns for match cards and rules for games to play. Cut the gift box or cereal box into a plain flat surface the same size as the piece of construction paper. Save time by preparing the cardboard in advance. Glue the paper onto the box cardboard and let it dry. If you are using cereal box cardboard, glue a colored sheet of construction paper to the opposite side of the cardboard to cover the printing. If time is limited, do this step in advance, too. After the glue has dried, use the ruler to make an even number of equally sized boxes. On a 9" by 12" sheet of construction paper, draw a three-by-four grid of 3" squares. 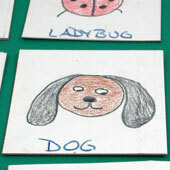 Have the children draw sets of pictures in each box. For example, make two boxes with a star, another two boxes with a heart, etc. The books of Ed Emberly are a terrific reference to have on hand to help children to develop drawing skills. Cut out each individual box, and you have a deck of cards for the game of memory. For those who are not familiar with the game of memory, mix the cards up and turn them over; then, the children can try to find the matches. Keep score, if you like. For complete rules, see the Match Cards and Game craft project. There you have it! A set of cards for the memory game! Thanks to Michele G., who submitted this craft project to Aunt Annie's Craft Exchange in 1996. Michele shared, "In the summer, I am the social director at a KOA campground. I have found this project very successful with all ages, but especially with kids 10 and under!!!" 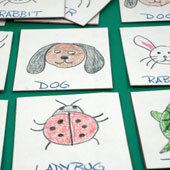 Parents: Make memory cards that help your child learn. Alphabet, number and color decks are good for pre-schoolers. Cards with pictures and words are good for early readers. For older children, make decks that correspond with what they are learning in science or history.